Agents then have to save the login credentials of their Zendesk account in the agent’s profile. Integration enables searching of records containing phone data matching caller ID, and pops up the corresponding record/s for specific events. The Screen Pop triggers when an agent is offered a call. Configuring Zendesk involves defining Screen Pop settings, and entering external setup properties in an agent’s profile. The Screen Pop applies to inbound transactions including phone, chat, and voicemail. If the search retrieves multiple records, the Screen Pop lists all matches in a table and displays the details of the first record. If the search fails to find matching records, then pops a new end user record. Termination of all phone and chat interactions using the 8x8 Virtual Contact Center application triggers an auto log. An auto log captures transaction details of interactions. For example, a call log includes information about the call answered time, call duration, call termination time, and more. Accepting an inbound interaction triggers a new ticket. At the termination of the call, the ticket gets updated with the auto log information. Log into the Configuration Manager. Navigate to Integration > Screen Pop tab. Check Enable Screen Pop option. 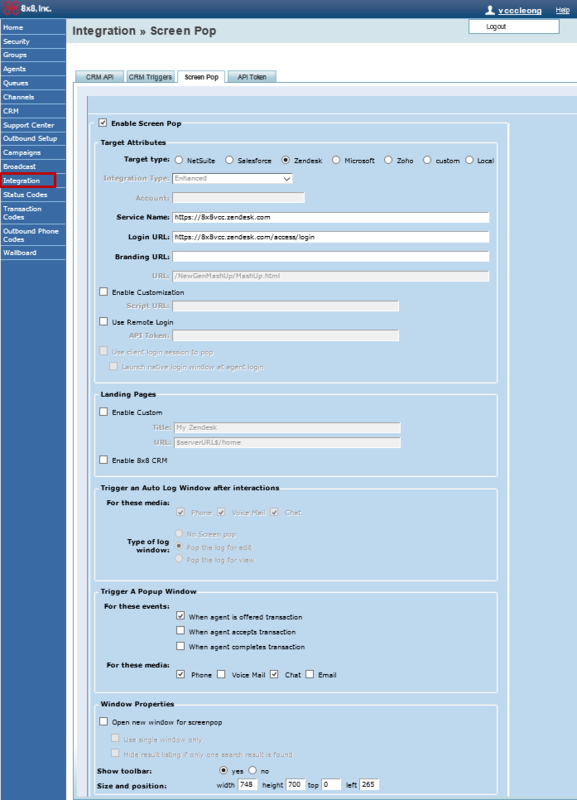 Select the Target Type – Zendesk. Enter the Service Name. The service name is the web address where your help desk is hosted. https://subdomain.zendesk.com For example: acmejet.zendesk.com. Enter the Login URL. Append /access/login to the service URL. Define events that trigger a Screen Pop for a transaction. Currently, we support screen pop for when an agent is offered a call. Auto log is selected by default and you cannot make any changes to these settings. The Screen Pop configuration in the Configuration Manager is now complete.